FARGO — Challenge and hope commingled at a recent gathering of about 750 Catholic leaders and parishioners from the Fargo and Crookston, Minn., dioceses. 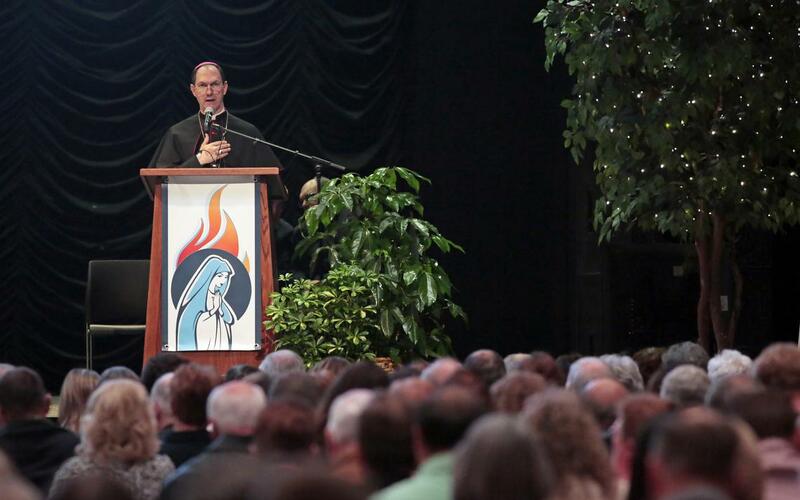 Ashley Grunhovd, the Fargo Diocese evangelization director, said the Convocation of Parish Leaders that took place last week at Fargo’s Avalon Events Center highlighted “missionary discipleship” and what it means to live and share the Christian faith with others. Bishop Michael Hoeppner of Crookston celebrated the opening Mass, noting how Jesus “called (the apostles) from their fishing to follow him,” an invitation carrying a sense of immediacy. Later, Bishop John Folda of Fargo said that though the church is to be in “a constant state of being sent, as Christ, into the world,” too often, we’re viewed as joyless or dour. He emphasized that all Christians, not just a select few, are called to share the gift we’ve received. But he also acknowledged challenges to this mission, notably sexual abuse scandals. The Rev. Frank S. Donio of Washington, D.C., an evangelization consultant for the United States Conference of Catholic Bishops, said that because of the “hemorrhaging” being seen in and from our churches, the church needs to act now. It starts by being fed with the Eucharist at Mass, but must not end there, he said, sharing stories about his Italian-American grandmother who lived her life in prayer, but showed the fruits in simple ways. The Rev. Thomas Richter, pastor of Queen of Peace Catholic Church in Dickinson, N.D., threw out some hard facts. Fifty years ago, he said, more than 50 percent of Catholics attended Mass regularly; now, that number stands at 12.5 percent. He gave similarly low statistics for Catholic couples receiving the sacrament of matrimony, despite a rise in the Catholic population worldwide. Robert Reinpold, 27, of Halstad, Minn., said the scandals being revealed have been frustrating, but they haven’t detracted from his faith. While grateful for the convocation, Reinpold said he would have liked more attention to liturgy, naming the sense of “verticality” as the most glaring lack in the church today. “We’ve focused on the horizontal, person to person, but we’ve lost sight of connecting with God,” he said. “I’m not saying I want to go back, but we’ve lost a lot of what it means to be Catholic,” he said. Reinpold pointed to the “we’ve always done it that way” mentality as another obstacle. Jordan Hjelle, 26, a parishioner from St. Michael’s Church in Grand Forks, N.D., agreed that “getting back to the basics” is crucial. A convert from Protestantism, he said the Mass is what compelled him toward Catholicism. “Coming to the realization that we have the body, blood, soul and divinity of Jesus sitting before us, and how important and beautiful that can be, is something so unique to us as Catholics,” he said. Rob Waletzko, of Lisbon, N.D., said he took a vacation day to attend the event but didn’t regret it, noting that he was struck with the idea that without evangelization, we’re dead spiritually. The event also included several panels that addressed obstacles to evangelization, including within our own families, witness talks by lay faithful and a praise and worship evening. For the sake of having a repository for my newspaper columns and articles, I reprint them here, with permission, a week after their run date. The preceding ran in The Forum newspaper on Dec. 8, 2018.